Well if anyone didn't run well this year , it couldn't be blamed on the weather. We had near perfect conditions in the 50's and a beautiful sunny morning. I was up early and excited so after my morning coffee, I hopped in the car and ate some rocket fuel (peanut butter and marshmallow creme) as I made the short drive down to Selma where I found parking a block from the start/finish. I picked up my number and chip and then joined Karla and Lisa for a warm-up mile. Then about 10 minutes before the start I did another half mile with some pickups to race pace and then made my way to the line. I got off to a good start, not getting suckered into the fast pace of the young and inexperienced that always seem to go flying off. I settled into a comfortable pace and found myself just behind NCRC friend Bobby Baxter. I was hoping the pace I was on was close to my overall goal of sub 22 because I didn't think I could go any faster without blowing up later. The first mile was good at 6:57, but I already knew my fantasy goal of beating my 2005 time was not going to happen today. So I settled in almost drafting Bobby as we continued through the neighborhood and then back onto the main road. Just before the turnaround and near the two mile mark you can see the leaders coming back and heading towards us heading to the finish. Aaron Tarter was in 3rd and Godiva's Anthony Corriveau was right behind in 4th. Clayton friend Brent George was not too far behind and then the first woman as expected was our own North Raleigh Threat, Laura Labella Frey followed by NCRC's Jordan Duvall running in his Vibram 5 fingers. Shannon Johnstone was the 2nd place woman just a little further back back in 2nd. I went around the cone and then by the 2 mile mark in 14:12, a 7:15 mile. I was hoping I hadn't slowed but the second mile here is always slower for me. I was still just a few strides behind Bobby but he began to gradually pull away and I was going as hard as I could. I could now see the runners behind me and Lisa was not too far behind and running strong. Margo was just a ways behind her and before long I could see the Marathon Princess looking good. A little further and along came Frank. I was really pushing now and hoping I could hold on to the pace and get under my sub 22 goal but these 5k's really hurt if you race them hard. I was able to keep up the pace and made it just under in 21:57. Woohooo ! After all my friends came in,Karla, Lisa and I went for a 2 mile cool down and got back just in time for the awards. All my friends really did well this year. Lisa was first in her age-group with a big time pr of 22:38. She is on fire these days and you'll be seeing more pr's this Fall from her. Margo was 2nd and Karla was 3rd but since they only go 2 deep with the trophies she missed out this time. I was very surprised that I got 2nd in mine but then I was :30 seconds faster than last year! Aaron went on to place 3rd overall, and 1st in the 30-39 age-group. Brent was third in the same age group. Anthony was 4th overall and 1st in the masters 40-49. Laura and Shannon went on to place 1-2 overall for the ladies and I believe it was a pr for Laura too. Jordan was first in the 20-29 group and Frank ran strong and placed 2nd in the 60 and over. I would also like to put in a word for a fellow Zebulon runner that I just met at the race, John Goodie. 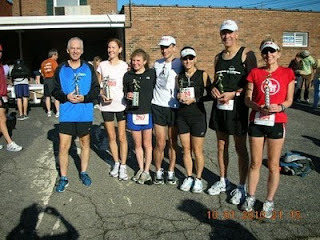 John is a regular reader of my blog and a new runner and he ran what I believe was a pr for him at the 5k distance too. Good job ! I'm really surprised that more Triangle area runners don't come for this race anymore. It is a flat , fast certified course and is one of the best bargains out with just a $15 entry fee when most 5k's these days are $25 to 30 and up. I would also like to proudly note that in 1981 when this was a 10k, my mother Frances Anderson was 51 years old and won 1st place in her age-group !